While traditional electronic circuit design based on a rigid PCB board substrate has been the reliable foundation of the digital technology age, there is a limit to what form factors and functionality this design can support. With the trend toward smaller devices and the rapid growth of wearable technology and IoT, innovation is stepping beyond modification of customary practices (which are reaching their limits) towards further embracing an alternative design concept: flexible electronics. 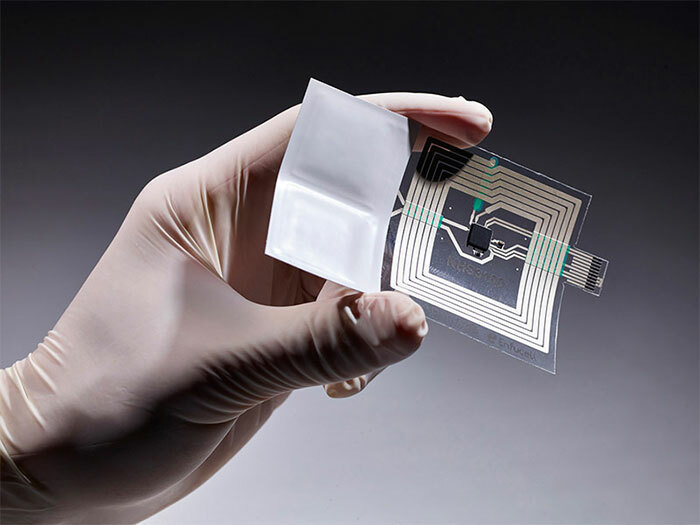 Also referred to as flex circuits, this next-wave technology involves printing/mounting electronic components onto dielectric flexible substrates, resulting in devices that can be bent, rolled, folded, and stretched while maintaining functional integrity. 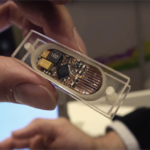 Such designs lend themselves to a wide array of possible applications, including sensors, medical devices, smart textiles, displays, flexible batteries, photovoltaics, lighting, automotive, and defense applications. This leap in circuit design is expected to spawn newly created applications that were not conceivable within the limitations of traditional architecture. The Nike+ FuelBand SE is a low-energy Bluetooth 4.0-enabled fitness device designed to be worn around the user’s wrist to measure daily physical activity as well as sleep monitoring. 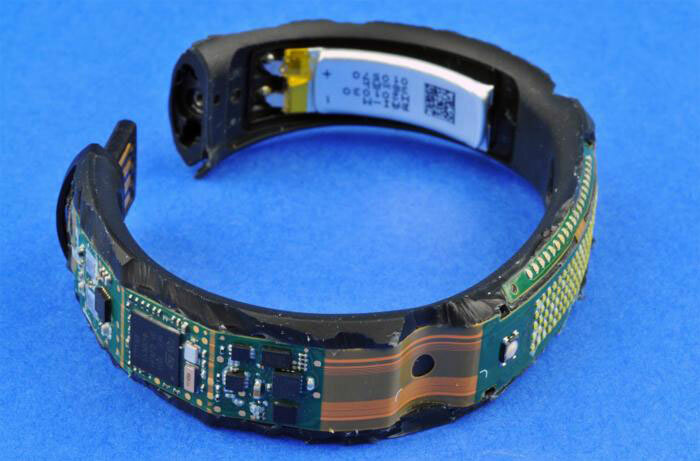 Activity is measured via a 3-axis MEMS accelerometer and stored until the device is synced with an iPhone, iPad, or PC via the band’s USB connector or Bluetooth. Flex circuits boast many positive attributes that promote intrigue and excitement in the tech world. 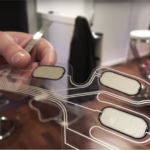 Compared to conventional forms, flexible circuits have the potential for lower production costs, lower energy consumption, better performance, and can involve more eco-friendly materials and processes. 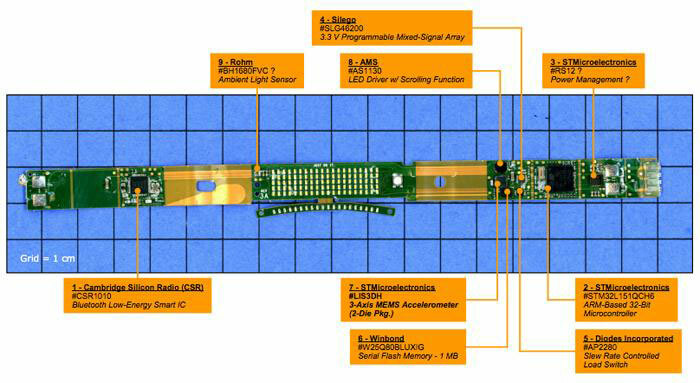 In addition, these designs allow for the combining of multiple functionalities, thus having the ability to replace multiple rigid boards or connectors in standard designs. All things considered, it is understandable why the flex circuit market is predicted to nearly triple in the next 10 years, resulting in an over $69 billion industry by 2026 according to IDTechEx research. 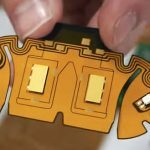 Flex circuit design improvements and advancements are focused on the most defining feature: the flexible substrate and thin layers of conductive circuit traces to which other electrical components can be connected, molded, or printed. 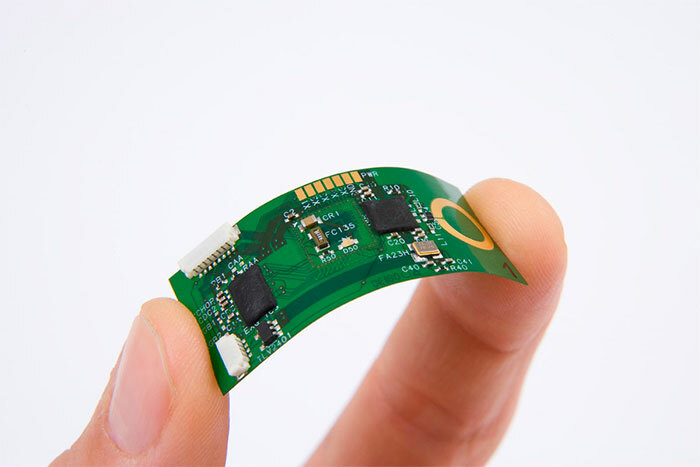 The capabilities of these substrates directly contribute to the most significant qualities of a circuit, including how flexible it will be, its heat stability, cost, ease of production, and performance. Polyimide and polyester films are some of the most widely used substrates for flex circuit manufacturing. Dupont Teijin Films is one of the leading producers of polyester films with their line of highly stable polyethylene terephthalate (PET) and polyethylene naphthalate (PEN) films. Specifically, their brands Melinex® (PET) and Teonex® (PEN) are biaxially oriented crystalline polyesters which have emerged as lead materials for flexible displays and printable electronics. Teonex® asserts exceptional properties pertaining to strength, heat stability, hydrolysis resistance, and electrical insulation. As an alternative to polyimide substrates, AI Technology has developed proprietary organic copper-clad laminate materials which are solderable and can be used at temperatures as high as 300°C. Their COUPLER™ flex circuit material has a low dielectric constant and high moisture resistance, effectively eliminating moisture-induced degradation problems commonly seen with polyimide substrates. AI Technology lists cost savings of this material at 50% of traditional polyimide flexible circuit material. Liquid crystalline polymer (LCP) substrate has demonstrated stable electronic properties which support its use in high frequency applications. Such applications include medical, telecom, optoelectrics, and high frequency interconnect systems. Flex circuit manufacture Tech-Etch offers an advanced process for chemical etching LCP which result in design freedoms comparable to polyimide films. While flex technology is poised to deliver unprecedented functionality in the future, at this stage of development traditional circuits still carry higher performance capabilities. Flexible hybrid circuits offer an interim solution as flex technology closes the gap on conventional design performance. 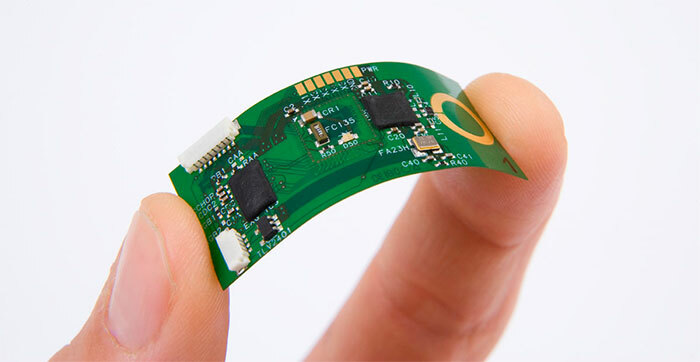 These circuits integrate ultra-thin silicon components (traditional design components) and printed conductive inks on flexible substrates. Flexible hybrid circuits offer a bridge between current designs and future innovation by leveraging the high performance of silicon technology with the low-cost production attributes of printed circuitry. The resulting conformable architecture has huge growth potential in wearable, IoT, and medical applications, where flexibility is necessitated. 1. Purdue University/Integra Life Sciences/Western Michigan University/Indiana University School of Medicine: Oxygen-sensing printed FHE smart wound dressing. The dressing would monitor oxygen levels of a wound bed and would also deliver topical oxygen to the wound in response to low levels. Proper oxygen levels are crucial for wound healing and would prevent further deterioration of wounds and associated complications. The structure of the platform (from previous research; Mostafalu et al., 2014) is is also suitable for other low-cost wearable and disposable biomedical diagnostic applications. Figure 4: 4-layer paper-based PCB integrated with oxygen sensor / ©Mostafalu et al. 2. 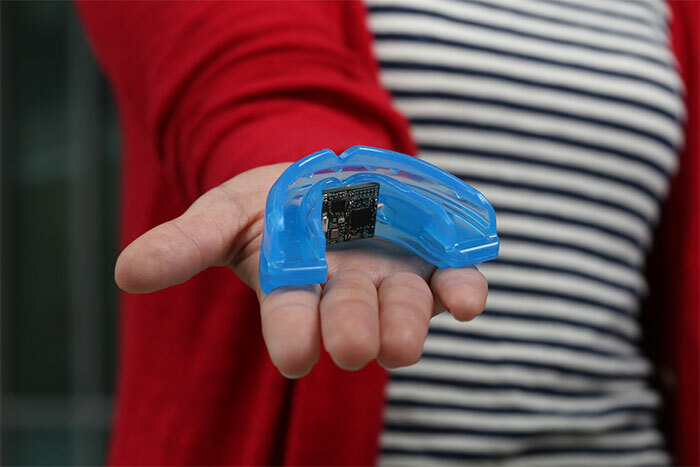 Palo Alto Research Center (PARC)/University of California at San Diego: Mouth guard with biosensor label that monitors chemical indicators of fatigue for military personnel undergoing training and other people in high stress positions. 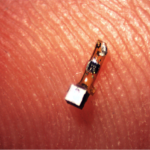 The sensor will relay the data via BLE. The coupling of sensor technology with a mouth-guard is ideal because they are required equipment for military training exercises and can be easily replaceable at low cost. Monitoring fatigue work to help keep military personnel safe and healthy through training and active performance, and more chemical indicators could be incorporated in the future. 3. California Polytechnic State University (Cal Poly)/Jabil Circuit/DuPont/NovaCentrix: Assembly technology for attaching ultra-thin chips on flexible substrates. In order for FHE to be successful, the flex technology has to be produced in a reliable, high-performing, and cost effective way. This team will be looking for more viable production methods that can be easily transferable for the lab to the manufacturing floor. Successful outcomes will help to increase comfort and performance for wearable monitoring systems and benefit the FHE industry as a whole. 4. Binghamton University (BU)/GE Global Research/i3 Electronics/Infinite Corridor Technologies/ Rochester Institute of Technology/Analog Devices/Corning Inc.: Fabrication of wireless pervasive integrated sensor systems. The project will concentrate on the cornerstone for advancing digital health and IoT through accelerating the fabrication of wireless pervasive integrated sensor systems. The envisioned future is one where both our internal and external environments are continuously monitored and data feedback on conditions are used to heighten personal health, performance, and productivity. 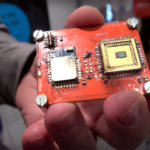 Wireless integrated sensor systems are the foundation for ubiquitous monitoring and BU and GE will be aiming to advance manufacturing technologies for these systems. From personal health monitoring to Defense applications, FHE are receiving the financial support and research focus from across private and public entities to quickly usher in advancements in the technology.